1) You want a computer repair services & IT Company with KNOWLEDGEABLE technicians. No semi-trained Geeks. 2) You want a computer repair services that UNDERSTANDS and CARES about your business. Business computers are different to home computers. They should learn about your business in order to make technology recommendations that save you money or boost your productivity. 3) You want a computer repair services you can RELY on. This means showing up when promised, responding quickly, and solving problems the FIRST time. 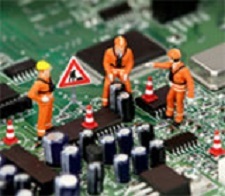 4) You want a computer repair services that is MORE than just computer repair. Today’s small business needs advice and support for Internet and email problems, Accounting software, document management, data backup & recovery, cloud computing, network support and more. D-Tek provides the following services either at your business or in our office. Whether you have 50 computers or just one, D-Tek knows your business depends on your technology. If your computers are down, the impact on your productivity (and stress levels!) can be significant. That’s why you need to find a trusted I.T. advisor who knows the challenges that you face and is committed to the success of your business. When you call D-Tek you get experienced and knowledgeable technicians at your service to come resolve any problem that you encounter. When the computer repairs are being done on site you can feel comfortable that the technician can explain everything in person and in terms that you can understand. Many times technicians are available same day. Computer hardware can go bad for seemingly so reason and at any time. If you find your computer refusing to turn on or failing to boot up properly we can help. Software can also go bad due to viruses and corruption in the system files causing the software to run slow, not work properly, or just not function at all. Our computer repair technicians see these problems on a daily basis and are experts making the repairs necessary and getting your system back up and running in no time.